It’s Friday! So, that’s good news. In other good news, one of my best friends is coming to visit over the weekend, and I can’t wait to see her. In some further good news, I had my hair cut yesterday for the first time in three years (ahem), and it worked out rather well. While I’m pleased with the end result, I now have two swingy-bangy bits of hair down either side of my face which are causing me a bit of consternation; I keep forgetting they’re there, so when they suddenly sweep down out of nowhere and waft into my line of vision, I tend to get a bit of a fright. There you have it. A woman who is frightened of her own hair. What has the world come to? Moving swiftly on. Today, I would like to talk about a book I recently read which seems to have caused very little in the way of a ‘splash’ in book-reviewing and book-blogging circles, which I think is a shame. It’s ‘Sorrowline’, written by Niel Bushnell. I believe it’s his first book, which makes the achievement all the greater. I came across this book a few months ago when I googled the word ‘Timesmith’, which I was hoping to use in one of my own stories. I was hoping I’d be clever enough to have coined the term, but – of course – someone had got there before me! 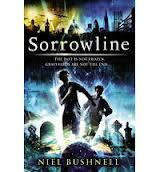 Niel Bushnell’s ‘Sorrowline’ is the first book in his ‘Timesmith Chronicles’, and it’s a really enjoyable read. It has only just been published – I’d been waiting for it for several months by the time I finally managed to buy it a couple of weeks ago – and it was worth the anticipation. The central idea behind the book is that each person’s gravestone is connected to the day of their death by a ‘Sorrowline’ – a mysterious link made up of grief and memories, and in some cases the person’s fear and anger and pain at the time of their death – and a talented person can use this connection to travel back in time. Jack Morrow is our hero, and he finds himself being attacked by terrifying creatures in a London graveyard one night several years after his mother’s death. A strange man appears, claiming to be his grandfather. The man urges Jack to travel back to 1940, to meet him there as a teenager, and that together they’ll work out how to keep Jack safe. Jack doesn’t really have a choice but to obey, and so he does as he’s told – and it works, much to his shock. He’s a ‘Yard boy’, or someone with the power to travel through time from graveyard to graveyard. When Jack travels back through time and meets up with Davey, his teenaged grandfather, I loved how Bushnell handled their relationship. Of course, Davey has no idea who Jack is and thinks the whole thing is an elaborate ruse – he even tries to make a bit of money by selling Jack out. Jack, despite being at a total disadvantage, uses his intelligence and strength of character to stand up for himself, work things out for himself and escape from the many tight corners he finds himself in. He’s no helpless 21st-century fool – he uses his knowledge of history to work out where he is and what’s happening, and he’s a resourceful, resilient young man. The gradual building of trust between the two boys is so cleverly handled that it makes the book’s conclusion all the more wrenching – but I’m not going to give away the twist, of course. A further layer of loveliness is created by the author’s use of folklore. There is an object in the story, a precious object which is being sought by the terrible ‘baddie’ Rouland, called the Rose of Annwn. This set my mind spinning off through the legends surrounding Annwn, the Welsh otherworld, and the ballad which tells of the legions of men who went to claim it, of whom only seven returned. I really loved what Bushnell did with his Rose, and what it turns out to be. Rouland’s guard is a band of fierce undead warriors called the Paladin (another nod to the medieval, which is great), all of whom are female – that was a refreshing turn. I liked the character of Eloise, a rogue Paladin who commits herself to defending Jack and Davey no matter what the cost to herself. She’s a great creation, though occasionally her special powers and abilities (as a result of being an undead warrior) seem a bit too convenient. But that’s a tiny quibble. Jack’s abilities to travel through time naturally lead him to think about his mother, and whether there’s anything he can do to keep her from dying. This is his primary motivation, and not finding the Rose of Annwn, even though he knows it’s also important to keep that huge treasure out of the clutches of Rouland. I really enjoyed the conclusion of this story, and how several plotlines were wrapped up while leaving enough to entice a reader back for Book 2. I often find myself confused and disappointed with time-travel stories, but not with this one. It all seemed to make sense and slot together, which made me admire Bushnell’s skill as a storyteller as well as his ability to create a beautiful character in Jack. Overall, I thought this book was fantastic. It’s a book for children, of course, but there’s enough in it to please any audience. I recommend you give it a try, and spread the word! Anyway, my fabulous hair and I are off to clean the house and get it ready for ‘comp’ny’. Hopefully I’ll get a bit of writing time, too. This entry was posted in Musings and tagged book review, characterisation, debut author, folklore, great read, mythology, Niel Bushnell, Paladin, reading, Sorrowline, time, time-travel, Timesmith on March 1, 2013 by SJ O'Hart. If it makes you feel better, I have a friend who’s allergic to her own hair. At least your hair doesn’t cause you physical pain? Lol. Well, I’m not sure it makes me feel better, but it does make me feel less weird. Also, very sorry for your friend! That must be a very strange allergy to experience. I’m imagining each of her hairs like a tiny ninja, karate-chopping her all over her head. Nasty.